I resisted Pinterest for quite awhile because I thought it would become a time-waster for me, just like Facebook had. Once I realized that I could use it to help me keep my thoughts organized though, I decided to give it a try and I don’t think I’ll ever go back! Fabulous writing and blogging articles used to get hidden in my inbox, buried in a sea of text messages, or lost in my computer’s history. Not anymore! Now when I read something that I think I may want to refer back to later, I just pin it to my Writing/Blogging board! And since I’m working on improving my blog/Pinterest photos, when I come across beautiful Pinterest pictures, I pin them here so I can refer back to them for inspiration. When Nathan sends me links to cool science videos and websites (like this really awesome octopus-disguise video), I pin those links to my School Resources and Ideas board so I won’t forget to share the information with my kids! We also have a School: Autumn and a board for spring and summer learning so those fun ideas can be at my fingertips as soon as the weather changes each year! Plus, I recently decided to create a board of things to learn before we visit somewhere! For example, this simple Beach Learning board was incredibly helpful in keeping my ideas in one place before our recent trip to the Outer Banks, NC. Bonus Tip: I keep a separate board with lists of books to read (this is perfect for pulling up at the library!). I love using Pinterest for recipes! I pick apples with my uncle each year so I have a small board dedicated to just apple recipes. (I also have a section for apple recipes in my recipe book at home.) Because my family loves to camp, I have a little board for camp cooking. I also have a board for Kitchen Tips and Tricks, which is a great place for me to put things like kitchen organization articles, cooking substitutions, and menu planning ideas. And, because when I’m cooking, I generally want to either make something I’ve already tried and liked or try a new recipe, that’s how I organize my main food boards! If certain boards make you feel bad, just unfollow them! One time, I unfollowed every single home decorating board (including my friends’ boards!) because seeing those ideas made me feel inadequate about how much I personally lack in the home-decorating area. Now that I’ve read, “The Nesting Place” by Myquillyn Smith, I’m inspired to try a few things so I started a living room decorating board of my own. I still don’t follow many decorating boards though because I find them overwhelming! In other words, if you’re not in a season where you’re cooking from scratch or doing a bunch of messy projects with your kids, feel free to unfollow those boards so you only see what’s relevant to you. After-all, it’s your Pinterest account! If you’re hesitant to unfollow, remember that you can always add those boards back later if you want to. As much as I love my Pinterest account, it can become a time-waster if I’m not careful, so I know that I must stay careful! Choose to make your own Pinterest account a time-saver by organizing your boards in a way that works for you. And don’t be afraid to change things up! If something stops working for you, then change it, delete it, or add something new so Pinterest can be a great time-saving tool! What’s your #1 Pinterest tip for fellow users? I love your tips! Sometimes when getting through my home feed becomes overwhelming, I unfollow some boards that I haven’t repinned from in ages. My #1 Pinterest tip is to back up your account, so you don’t ever lose it! 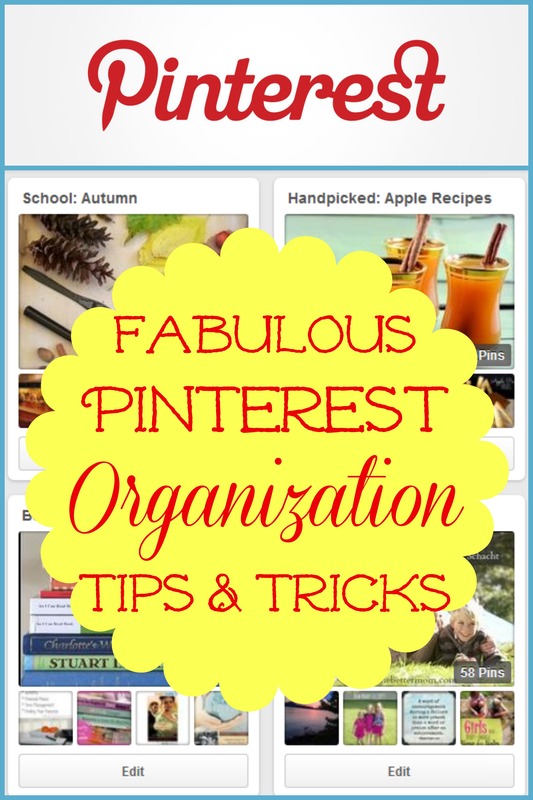 When I got into Pinterest a few years ago, I found there was no backup tool, so my partner and I created Pin4Ever. We offer a one week free trial of backups, plus several helpful tools that are permanently free. I just love knowing my pins are safe, and also love being able to give people a free backup to protect their pins! Sounds interesting, Christina! Thanks for sharing! This is so helpful. Can you teach me how to delete my pins that I no longer like? Beth, unfortunately you need to delete, then re-add the pin in order to change the photo. Maybe Pinterest will add that feature eventually! To switch out the board cover image go to Boards > find the edit button (pencil) > scroll down to change cover and select the image from there. You can even upload an image toake it your board cover. This has to be done on a desktop. It won’t work on mobile if I’m not mistaken. Hope this helps! This is a good tip, thank you Jenny! How do I put my pins in alphabetical order? Martha, you can organize (and therefore alphabetize) your Pinterest boards any way you like by dragging them into place. Unfortunately, I don’t believe you can sort pins that way since your most recent pins will always be on top. You can quickly search for a specific pin though by typing a keyword into the search bar, then selecting “my pins” to the right of that. I used to keep all my boards in alphabetical order, but now, when I move one into its correct place, another moves out of place, and I am unable to keep them all in alphabetical order . . . if you can keep them all in order, what’s the secret? Del, I recommend trying it in a different browser and seeing if that helps.